At Aztec Electrical we are fully licensed electrical contractors with the State of Oregon. We use the best products and most advantageous electrical solutions for residences and businesses. We service Rogue Valley with prompt and professional service. As a full-service Rogue Valley residential electrical contracting company, we can do it all for you. Whether you want to upgrade your existing service box (from fuses to circuit breakers), install dedicated circuits to sensitive electronic equipment, or rewire appliances with heavy duty wiring throughout your home. 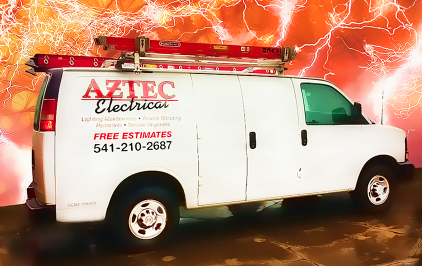 Aztec Electrical trucks are fully stocked, so our electricians can handle any repair or service once they arrive. Contact us anytime for your residential emergency or remodel electrical repairs, whether you live in Medford, Ashland, Grants Pass or the surrounding area.